Opportunistic investors can find reasons to pounce on Cheniere Energy and Green Plains. Now's the time to buy these stocks. Not every stock fresh off of the announcement of second-quarter 2017 earnings has performed well in the aftermath. While readjusting a company's valuation can make perfect sense in light of certain operational updates, there are often times when stocks get unfairly punished for short-term reasons. That can present buying opportunities for opportunistic investors. For different reasons, Mr. Market decided to turn a cold shoulder to liquefied natural gas (LNG) exporter Cheniere Energy (NYSEMKT:LNG) and ethanol producer Green Plains (NASDAQ:GPRE). Here's why now's the time to buy these stocks. There has been a lot of talk of America's trade deficit recently, but the data shows tremendous reasons for optimism for one specific reason: energy. Energy-related products accounted for 43% of the nation's trade deficit in 2010 before falling to just 26% in 2014. It made up (by far) the largest net trade-balance benefit in that span. And that was before Uncle Sam began exporting crude oil and LNG. In fact, the United States is expected to become a net exporter of natural gas in 2017 for the first time since 1958. While most export volume today is comprised of land-based deliveries to our North American neighbors, LNG exports are beginning to come online in a big way. Total natural gas exports today average about 8 billion cubic feet per day, but by the end of 2019, LNG export capacity alone will total 9 billion cubic feet per day. Over one-third of that will belong to Cheniere Energy. Despite the company's long-term potential, the stock was discarded by investors in early July before getting crushed in early August after announcing quarterly results. The timing of deliveries affected revenue during the second quarter of 2017, but there was a bevy of good news for Cheniere Energy shareholders. The rating agency Fitch upgraded the Sabine Pass facility's debt rating, management increased its full-year 2017 adjusted earnings before interest, taxes, depreciation, and amortization (EBITDA) guidance, and a giant $500 million investment commitment was made to expedite the arrival of a natural gas pipeline from the Anadarko Basin to the Gulf Coast. Cheniere Energy stock's pullback could be a great opportunity to add shares for the long term, especially given the opportunity in LNG exports. Speaking of exports, LNG isn't the only American-produced commodity witnessing impressive demand overseas. Ethanol has quietly become one of America's best exports in the last several years, and export volumes in 2017 are on pace to smash the 2011 record of 1.2 billion gallons. As the nation's third-largest ethanol producer with 1.5 billion gallons of annual production capacity, Green Plains is poised to reap the rewards from growing international ethanol consumption. Today, it exports about 20% of total production and is constructing an export terminal in Texas with an initial capacity to offload 1.1 million barrels of products. It should quickly find customers when it comes online in October 2017, especially after Mexico approved 10% ethanol blends in the nation's gasoline supply -- nearly double current blend rates. 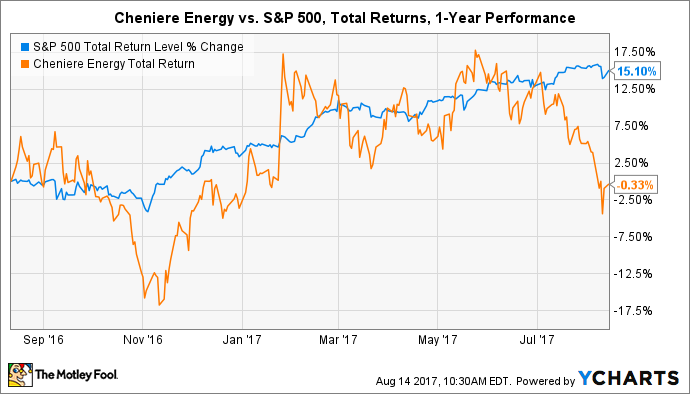 Similar to Cheniere Energy, the long-term potential was overshadowed by weakness during the second quarter of 2017. Green Plains stock was hammered as a result. It's easy to see why Mr. Market punished Green Plains. Ethanol margins were their lowest in over five years during the end of the quarter, which forced the company to reduce output at nine production facilities. Even still, production remains unchanged from the same period in 2016. Even better, Green Plains has diversified into profitable logistics, cattle lots, and food-grade vinegar businesses. All non-ethanol business segments combined for $71.3 million in EBITDA during the first half of 2017 -- about 85% of total EBITDA during the period. Management expects the full-year contributions to be in the range of $145 million to $160 million this year, and possibly as high as $190 million in 2018. In other words, the ethanol leader will continue to benefit from long-term opportunities in both domestic and international consumption, while high-margin businesses will provide shareholders a safety net for volatility in the biofuels markets. 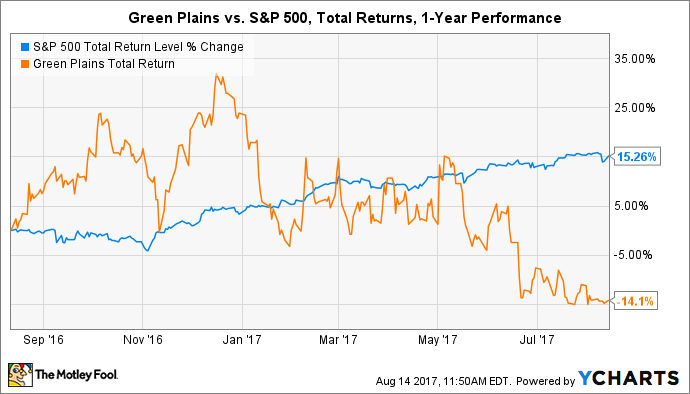 Green Plains stock is an easy buy right now for long-term investors. Cheniere Energy is knocking on the door of an enormous opportunity in American LNG exports. While it takes a considerable amount of upfront capital to build liquefaction facilities, they should become perennial cash cows once online and fully utilized. It will take decades for the company to pay down its debt to more reasonable levels, but with each passing quarter, it looks more and more likely to happen. Green Plains has a much cleaner balance sheet than the LNG exporter, but has struggled to convince Wall Street that its fortunes are no longer dictated solely by the performance of its ethanol segment. That should gradually change over time, especially if recent acquisitions and planned investments continue to deliver healthy profits. That's why both stocks are buys right now for opportunistic investors.